BCCHardware has been working with Plextor since 2004 and the good old days of the $800 Plextor PX-504A which was 4x DVD+R Writer. Things have changed a bit for this company as they merged with LiteOn and actually sacrificed some of their premium products to bring the prices down to a very competitive level. They still have the best warranty in the business - last time I looked and still have a full selection of optical storage drives for DVD and Blu-Ray. I think what caught our eye this year was their PX-NAS4 box and their upcoming PlexConnect package. 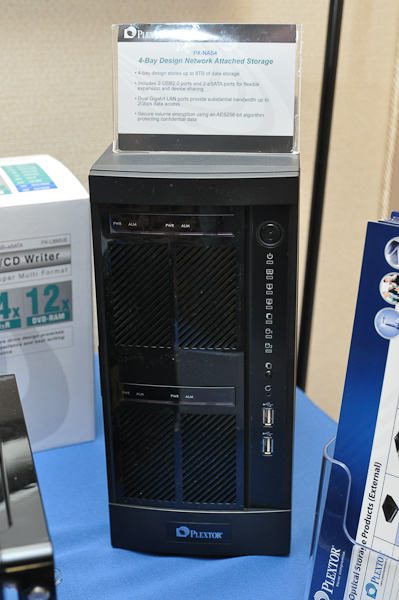 The PX-NAS4 features a Marvel 1.2GHz processor and hardware RAID that should give it pretty decent performance. It won't be as speedy as a the QNAP TS-459 Pro+, but it should be a whole lot faster than the Patriot Valkyrie and the D-Link DNS-323. The Plextor unit can be found for $400 (or less) making it a very decent price in this four-bay market. The PlexConnect is honestly nothing too special in terms of functionality. 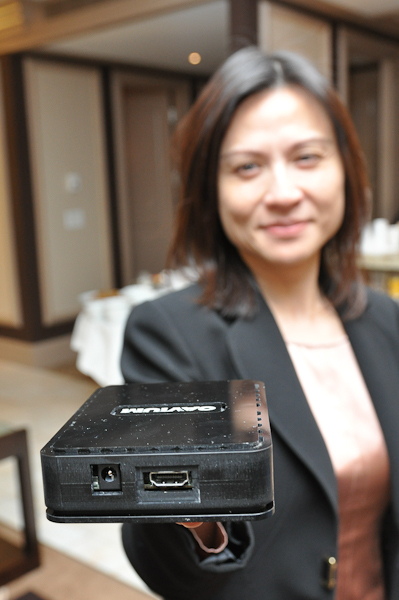 It's Plextors version of the Wireless HDMI extender - and this one can do 3D Blu-Ray. That is actually pretty impressive as it takes a lot of bandwidth, but application for a box like this is pretty limited. Plextor is also working on a SATA III (6Gbps) drive and it should be available later in the 1Q of this year. They showed off some performance, but for a SATA III drive, it wasn't all that fast. We'll have to see how it shapes up as it gets closer to the retail launch. Please check out our pictures from Day 2 at CES 2011 here. Also, the full list of CES coverage can be found here. Please post your comments, questions and feedback at the "Comments" link below.